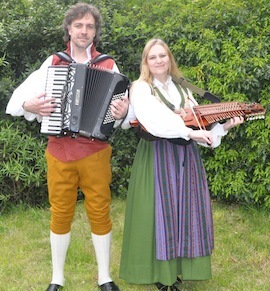 We've now got our publicity flyers for the nyckelharpa workshop at Halsway Manor - click here! June is the month of more ceilidhs. We love ceilidhs! Get your dancing shoes on! The Victorian Jubilee will see us dressing up in Victorian Era clothing and celebrating in stye at Witley Court Gardens. We're really happy to be part of the Blast from the Past team of musicians and it's great to branch out into a new era! Jonny now has his brand new folk dräkt, so watch out for us in your local IKEA! We make a handsome pair! The Scandi session is coming on nicely! We have a website set up now with lots of different tunes, these tunes are being added to all the time, so keep checking back! The next Scandi Session will be on Sunday 10th June at The Swan in Rayne. Kick off is at 8pm with a learning session at 7pm. The nyckelharpa team will be on hand. More details here.